The earliest fast reactors designed and built in the 1950s give essentially no usable cost information. They were small, and there were just a few of them: EBR-II at 20 MWe; Fermi-1 at 61 MWe; and DFR in the U.K. (pictured right), at about 15 MWe. The principal experience is with the oxide-fueled demonstration plants that came on in the 1970s. France built the 250 MWe Phenix reactor, operational in 1974 and only taken out of service in 2009. Germany built SNR-300, completed, but never operated due to anti-nuclear sentiment in that country. The U.K. built and operated the 270 MWe Prototype Breeder Reactor, PFR. It was troubled by problems in the non-nuclear portion of the system and has been closed down for many years. Japan built and operated Monju, a 300 MWe reactor, shutdown after a relatively minor sodium leak in 1995, and returned to operation in May of 2011. TheU.S. built and operated a test reactor, FFTF, with a thermal power of 400 MWth, which operated for a decade without any problems. 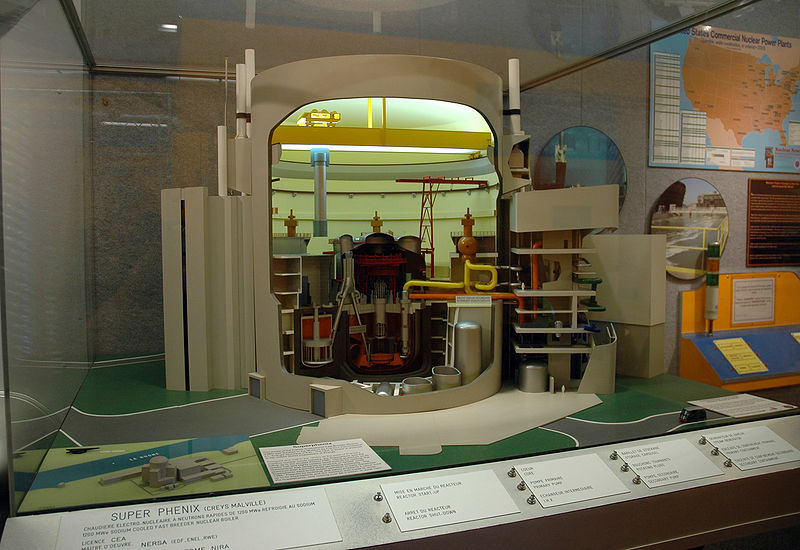 Because it had no electrical generation capability, it was shut down when need for fuel irradiation experience in a fast neutron environment lessened and there were no further U.S. plans for fast reactor introduction of any kind. The U.S. demonstration plant, CRBR, at 375 MWe, was ready for construction, but was cancelled by the Carter administration, and was eventually terminated in 1983. In the West, Francewas the exception. The French followed their demonstration plant with a plant of commercial size, and of the nations that had active fast reactor development programs they went further toward the goal of commercialization of fast reactors than any of the others. Following a 40 MWth experimental fast reactor Rapsodie in 1967 and the 250 MWe Phenix in 1974, a 1,240 MWe full-scale demonstration reactor, SuperPhenix, began operation in 1985 (pictured at the top of this post). It did not benefit significantly from Phenix experience, as its design had begun almost concurrently with Phenix. It was constructed by Novatome, a largely French European consortium, under a turnkey contract. The fixed price for the nuclear steam supply system was about $1 billion . EdF, the French national utility, was responsible for the balance of the plant, which was about 40% of the total cost. The capital cost of SuperPhenix was reported as 2.1 times that of French PWRs of the time . 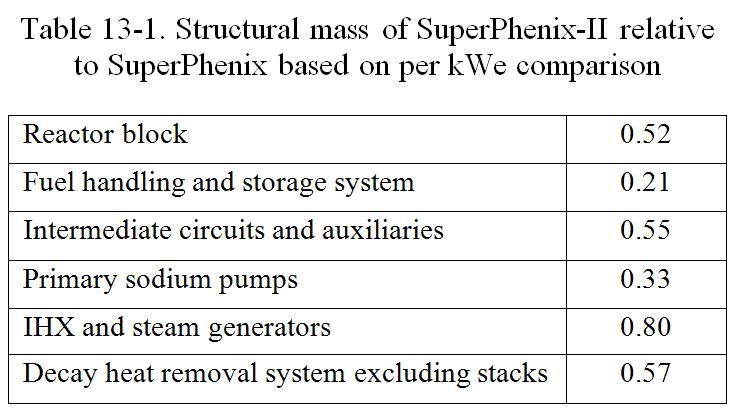 But SuperPhenix did show that a near-commercial-size fast reactor was more expensive than an LWR. Somewhat blurring the issue even for SuperPhenix, however, was the fact that it was not a strict follow-on from the totally French designed Phenix reactor. The latter was a simple design; the SuperPhenix design was considerably more complex. Nevertheless, estimates from SuperPhenix experience form the most direct comparison we have. The scaleup from 250 MWe to 1,240 MWe was a gigantic step and assuring that the reactor would actually operate satisfactorily was the primary goal. But with the cost reduction the principal goal for the follow-on SuperPhenix-II, significant reductions in construction commodities were possible, as illustrated in Table 13-1. This estimate was made in 1985, when the SuperPhenix-II design was still in early development stage. After an extraordinarily troubled history of protests, court cases, violence, and low-level sabotage including a rocket attack by Greens, as well as some technical problems, SuperPhenix operation was finally terminated once and for all in 1997. A new government had come in with Green participation, and that fact, combined with SuperPhenix’s erratic operating record, was sufficient to end its operating life; decommissioning began the following year. The prospects for SuperPhenix-II died with it. Nevertheless, the work that is summarized in Table 13-1 does illustrate where the potential is for cost reduction in fast reactor designs in a mature economy of fast reactors. It suggests that the potential for economic competitiveness for the first fast reactors built is approachable, and is likely in a larger mature economy of fast reactors. 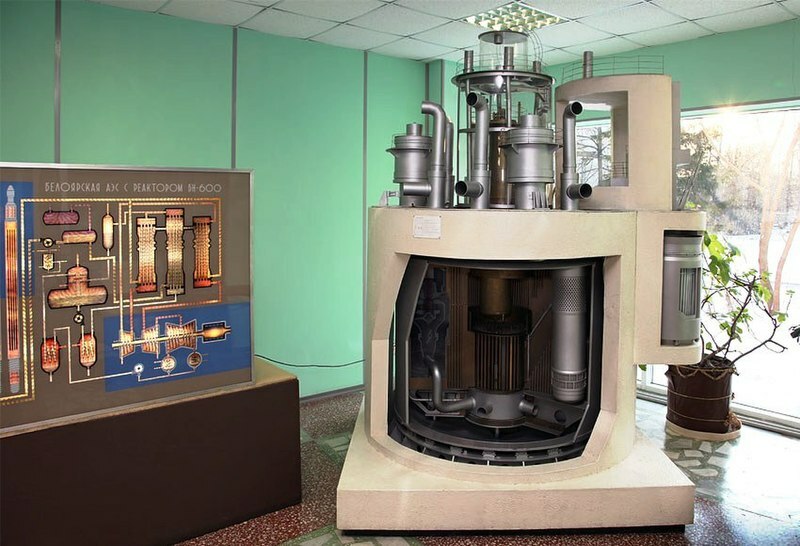 Model of a BN-600 reactor, displayed in the Beloyarsk Nuclear Power Station, Russia. India, too, has successfully operated a small Fast Breeder Test Reactor (42.5 MWth/12 MWe); it has been operating since 1985, and has included demonstration of a full carbide-fueled core.India probably will be the first nation to commercialize fast reactors. In 2004,Indiastarted construction of a 500 MWe Prototype Fast Breeder Reactor (PFBR; pictured right). The capital cost for this project is estimated at $622 million. The construction completion is targeted for 2014. Following this project, four more similar 500 MWe units are planned in two twin units at two different sites. The capital cost for these units are estimated at $544 million each. With different materials and labor rates and financing structure, it is difficult to judge how this would translate to a plant built in the U.S. India’s current commercial reactors are small 200 MWe heavy water reactors, and the 500 MWe fast reactors should compete favorably in India in $/kWe. However, the fully-developed LWRs to be introduced later may have significant capital cost advantages there as well. It seems that low pressure reactors, like IFR and LFTR, have a good scaleup cost reduction potential, compared to pressurized reactors. With pressurized reactors, the containment needs to be bigger and bigger to accomodate a pipe break sending the larger mass of coolant into the containment. Also, making bigger pressure vessels gets tougher and tougher as you go up in size. The wall thickness increases rapidly, and forging and welding the huge vessels is a tedious and specialized job. Now of course, without any meaningful pressure potential, the containment of IFRs and LFTRs need not be much bigger as the reactor capacity increases. And the vessel, being low pressure, is easy to forge and weld. One thing I would like to know is the breakdown of the IFR cost. What part is for the pool, for the containment and isolation, for the double walled steam generators, pumps, reprocessing cells, etc. Anyone got something recent? posted 7 April 2012 at 11:55 PM by Cyril R.
Cyril R, that breakdown you are looking for will come in Part 4, when the IFR (including component costs) are compared to a typical LWR (it is table 13-2 in the book). posted 8 April 2012 at 12:49 AM by Barry Brook in reply to Cyril R.
Okay, so the Wikipedia entry on EBRII says that it cost 32 million USD for 19 MWe of electricity. Which is $1.68 per Watt. Doesn´t seem that much to me, even adding inflation it would make it around $4 per Watt. Not bad for such a small, prototype plant. posted 8 April 2012 at 12:53 AM by Cyril R.
Do these costs for the breeder reactors include the fuel reprocessing?? Looking forward to hearing from the cost guys here like PL and Harry2wr. It’s all about cost nowadays. I have been thinking about the cost discussion a lot and I think that there might be an error when the usual LCOE is calculated. I don’t think they use a high enough life assumption for the NPP. These reactors run way beyond the life of the loan (and above the original design life). There was an article in WNN today about Robinson NPP,, one of the first nukes built in around 1960. 50 yrs and still boiling the pot. GE did a fuel cycle cost analysis. They figure fuel works out to be about 1/2 cent per KWh given recycling facilities running at 100% of capacity. I.E. A Prism build rate of 1.5 GW/year so that the light water reactor recycling into ‘startup’ fuel for Prisms is kept busy. Then the IFR fuel recycing facilities start coming on line about 5 years after the first IFR starts up. Yes, it’s all about cost these days (and an appropriate level of safety and risk that is properly comparable with other industries and other electricity generation technologies – with radiation phobia expunged). I was intending not to comment, but I couldn’t leave your prod unattended :) So here is my initial reaction. Yes, Gen IV will be the way of the future. Yes, we will get there, in time. But, it is a long way off until Gen IV replaces Gen III as the plants of choice in a fully commercial environment. I suspect it is several decades away. I say this because the life of nuclear plants is so long, it takes a long turnover time to learn and apply the lessons of the earlier versions to newer versions. It’s taken nearly 60 years to get thermal reactors to where they are now. I expect it will take not much less time to get one or more of the many possible types of Gen IV through to the same level of maturity as the Gen III’s are at now. 4. I expect the most valuable and cost effective thing we could do would be to start educating the academics, teachers, public, media and politicians. I’d suggest this could best be done by establishing education and research facilities (e.g. at a faculty in at least one university in each mainland state of Australia). One of the goals would be to research to determine how Australia could implement nuclear power with cost of electricity less than from coal generators. If we give that task to our researchers and engineers, I am convinced it can be achieved. Not only can it be achieved, but by setting the task, establishing the research and education facilities to support it and providing the funding, the scheme will (if handled properly) cause strong momentum to educate the educators, the public, the media and the politicians – admittedly over a period of perhaps a decade. The Snowy Mountains Scheme had this effect on Australia. It could be done again. I am convinced this is the approach we should take – and it is the solution that will actually put us on the path to the major emission cuts desired by 2050 and beyond. It has another benefit too. It will put Australia in a position to be able to help the less develop countries (e.g. in Africa and poorer Asia) to implement nuclear at a cost less than coal. I am not saying we will build reactors in Australia. But we can build power stations using procured components. We are good at it as we showed with 40 years of exporting our hydro expertise we developed on the Snowy Mountains Scheme. the steam generator in LWR’s have huge costs for maintenance. Look at what’s happening at the San Ofre plant in CA, US. They just had the steam generator replaced and now there are huge issues w/ it. Factor that into the cost model. I meant to say, in my previous comment, that I have difficulty taking any of these sorts of cost estimates seriously. To me they are no more believable than the cost estimates the renewable edvocates have been producing for the past 20+ years. When I can see competitive bids, audited cost of completed projects, operating performance and costs over good part of a plant’s life, then we have a handle on cost of electricity. We have these costs for Gen II, not yet for Gen III+, and certainly not for solar thermal with storage. It will be decades before we have such costs for Gen IV nuclear. These cost comparisons kill me. Literally there are hundreds of variables that come into play. If we compare the costs of an IFR system w/ a LWR we have to strip out the cost of the fuel reprocessing. A power station operator with a self-sufficient breeder need only top up with relatively cheap natural uranium metal. DU , depleted uranium, would not be quite so welcome, because it is depleted of U235. RepU , reprocessed uranium, may well be still enriched in U235 over the 0.7% in natural uranium, but it also contains a much higher proportion of (absorbers) U234 and U236, and depending on its history, (hot) U232. A commercial operator may well be required to accept such fuel but he or she would certainly negotiate for its arrival on site as shaped blanket metal and at the same price as natural uranium. Asked to pyroprocess LWR fuel, he might say, someone else should pay for the convoluted exercise of turning a sow’s ear into a silk purse. And not in my backyard either. More likely, an operator with a pyroprocessing plant would actively seek used fuel from small burner reactors, (eg ) as small burners must change over their fuel while a high content of fissiles is still left in it. IFRs do require a hefty start-up load of plutonium, however Pu may now be a lot cheaper to buy than it cost to stockpile it. Although it has cost a lot for the PUREX process to extract plutonium, it is no longer fashionable among bomb makers and previous fast reactors did not eventuate, so the market may well be awash with oversupply for some time. Only in the distant future, after the rollout of a vast fleet of fast reactors, would a shortfall in plutonium supply justify the reprocessing of LWR fuel for its meagre return of Pu alone. After your previous helpful comments, may I prevail upon you again with another series of questions? As a UK resident, I would like to focus on on the potential use of of S-PRISM to handle our plutonium stockpile. 1) In your last comment, Roger, you suggest that it may be cheaper to sell plutonium at a loss than to continue to stockpile it. I find this statement very surprising, given that I have, possibly naively, regarded the stockpile as a huge national asset in terms of energy security and one that should not cost a huge amount to store until such time as breeder technology is ready to deploy. However, your opinion seems to accord well with current preferred Government opinion. Given that selling off the stockpile would apparently cause considerable political difficulties (although the India would almost certainly put it to good use), the preferred option has, until the suggestion by GE to burn it in PRISMs as an alternative, been to downblend it to MOX fuel and sell it at a loss in this manner. Question: Why is the plutonium stockpile so expensive to store such that a very high price is being considered by the Government to get rid of it. rather than to store it until such time as it can be used as fissile start charges for breeder reactors? Are the costs high because of proliferation concerns? If so, are these concerns, in your opinions, grossly or somewhat overstated or are they reasonable? 2) Is it potentially less safe to run an IFR in high breeder configuration than as a burner? If so, is this associated with fewer delayed neutrons and less stability or fissile/fertile ratios? If it is, are you both satisfied that the decreased safety is minor, controllable and outweighed by improved inherent safety associated with low pressure and passive cooling? a) In the short term, until pyroprocessing is established with subsequent change to breeder mode? As a sequel, if you answer in the affirmative, why has this possibility not been made manifest, either by GE or UK negotiators? b) In the long term, until the stockpile is mainly consumed? 4) If the S-PRISMs are indeed acquired, what would be your preferred choice of fuel? Would it be Pu/DU/zirconium, Pu/U/zirconium, Pu/thorium or none of the above? Would some selections be likely to require extra delays associated with fuel qualification issues? You worry that LCOE calculations suggest that nuclear generation currently remains uncompetitive with that from fossil fuels and that, in order for its large scale deployment, it is mandatory to reduce reactor construction costs. Might I ask your reaction to the very interesting comment by George S upthread to the effect that LCOE calculations for nuclear may be unflatteringly high because they are normally calculated over the loan repayment period rather than the lifetime of the reactor? I also wonder whether you have read the very recent report from the Smith School of Enterprise and the Environment (www.smithschool.ox.ac.uk ), entitled “Towards a low carbon pathway”. You would probably endorse the authors’ support for nuclear and their somewhat scathing (though buried in the body of the report) comments relating to renewables. I suspect you would be less happy with their conclusion (unlike that of MiT authors) that rapid nuclear expansion on a global scale would only be economically possible if a switch from once through to closed fuel cycle reactors were to take place in the near future. (I appreciate that Australia is an exception because of its massive uranium reserves). Finally, an expansion of nuclear power involving once through reactors will result in greatly more SNF which will have to be disposed of.. While this is not be a problem from a technical perspective, it most certainly is from a political one. Political problems are often much costlier to fix than technical ones. It is for this reason, for example, that South Korea wishes to move quickly to fast reactor technology and pyroprocessing. Given the above conclusions, there may be as many merits in arguing the case that Australia would do well to by-pass Gen 3 technology and move directly to Gen 4 as there are in the ones you deploy. Peter Lang, I disagree with your pessimism. Your argument strikes me as similar to those of Vaclav Smil — history is king, and damn the context or exceptions! We know from first principles that a major reason why renewables are expensive to build — and difficult to get good cost estimates for in the absence of actual data on large-scale implementation — is that these technologies are very material-intensive (concrete, steel etc.) due to their extremely low power density, as well as the facts that materials must be transported to remote sites, site preparations are extensive, large amounts of new long-distance transmission lines are typically required, and extra infrastructure is required is storage is to be considered, etc. Conversely, we also know from first principles that next-generation nuclear, like current generation, has an incredibly high power density and requires relatively little material inputs per W. We also know that unpressurised systems with inherently passive safety systems, like the IFR and LFTR, are inherently less complex than thermal reactors (which require high-pressure systems and multiple levels of engineered safety systems) – more on this in IFR FaD 13. Yes, the IFR and LFTR will be first-of-a-kind when built, and may be 50 to 100% more expensive than their settled down costs (and almost certainly, initially, more expensive than LWRs). However, I don’t think an a priori argument can be made, logically, that just because FOAK costs for low-power-density-and-intermittent renewables are consistently high, that this need be the case with Gen IV nuclear. You also pointed out that Hanford – a very early pre-commercial reactor, was cheap and successful. Why not apply this lesson of history to the IFR, especially when, as Cyril R pointed out, the 1964 prototype of EBR-II was built for ~$4/W in today’s dollar terms? Actually, the IFR doesn’t do too well here. Its primary sodium heat exchanger is likely to be cheap and compact, yes… due to the low pressure, high thermal conductivity, and low corrosion of sodium. But the steam generator in the secondary circuit is definately worse than a PWR steam generator. For one thing, the higher steam temperature and pressure, make its steam more corrosive and its components need to be thicker. Pressure differential in a PWR steam generator is around 70-80 atmospheres (typically 155 atm. primary, ~75 atm. secondary), while an IFR would preferably use at least 150 atmospheres of steam and the other side is likely designed to be less than 10 atmospheres. Steam temperature in the IFR would be over 400 degrees Celsius, compared to a 273 Celsius in the PWR. For another, the steam-sodium reaction requires considerable engineering to deal with; double walled tubes, isolation valves to stop the sodium-water reaction if there should be a leak. If you have a large IFR you’ll have at least 10000 tubes in the steam generator, and with a 150 atmospheres pressure differential in each and every tube, there’s always a chance of a leak, and engineered safety needs to be provided to deal with it. One the upside, the higher thermal efficiency means more power per thermal input, and there’s never any water in the core or containment, so no pressure provisions have to be made. There’s only noncorrosive nonvolatile sodium. That means big $$$ savings and big inherent safety gain – pressure is the limiting factor for today’s reactors, if you scrap that from the entire containment and reactor, it removes the biggest failure cause. posted 9 April 2012 at 1:31 AM by Cyril R.
Also I wanted to share this PDF, “design considerations for economically competitive sodium cooled fast reactors” from INL. The short study looks at a number of potentially cost reducing and performance enhancing adaptations to sodium cooled fast reactors. These are: an improved hybrid loop-pool design (with advantages of both without the disadvantages of either), a multiple reheat helium Brayton cycle, and more modular passive heat removal systems. posted 9 April 2012 at 6:32 AM by Cyril R.
I don’t believe it is pessimism. I believe it is realism. I think you’ve missed the main point of my argument. NPP’s have a long life. So it takes a long time to gain through-life operating experience and apply the experience in the design, construction and operation of the next version. That is why it will take a long time for Gen IV to reach the stage of being commercially competitive. On top of that we have the dead weight of a nuclear regulator whose focus is primarily on safety (with little concern about the cost) instead of on cost of electricity. You also pointed out that Hanford – a very early pre-commercial reactor, was cheap and successful. Why not apply this lesson of history to the IFR …? Yes, I recognise a number of statements I frequently make could be perceived as being in conflict. However, they are not conflicting in my mind. Bear with me while I attempt to clarify. On one hand I argue that it will take decades until one or a few of the Gen IV technologies currently being advocated by a range of different interest groups, will be commercially viable (cheaper electricity than Gen III+ in a competitive commercial environment). On the other hand I’ve frequently argued that nuclear should be cheaper than coal if we got rid of the impediments we’ve imposed over the past 50 odd years. And I’ve pointed to Hanford B to support my case, arguing that if we could build a thermal reactor 65 years ago in 18 months and it then ran for 24 years with power uprates by a factor of nine, then why can’t we build simple reactors and build them fast now (and before everyone screams I recognise Hanford B was a totally different design and such a design and materials would not be acceptable in commercial reactors today). My point remains that the first ever large nuclear reactor was built in 18 months and that was 64 years ago. We’ve gone backwards not forwards in productivity. The reason, I argue, is the regulations and navel gazing created by 50 years of anti nuclear protesting. We are not going to get over that in a hurry. I am strongly convinced of that and point out that not you, Barry, nor a single BNC regular contributor is interested in the issue of what would need to be done to remove the impediments to low cost nuclear. It is absolutely clear, from the lack of response and/or derision every time I post on the topic, that that statement is correct, despite you denying it each time I state it. So, if BNCers are not interested in delving into the causes of nuclear Gen II and Gen III being too expensive, what chance of getting a change of focus for Gen IV any time soon? I’m still writing the background here, so please stick with me a bit longer. Another point I frequently argue is that small nuclear reactors could be rolled off a production line like WWII tanks and like modern aircraft. But that is in the future. We have a long time, I believe, until they will be commercially viable. They will evolve just as aircraft do and just as other electricity generation technologies do (i.e. over decades). We can compare the rate of development of nuclear with the rate of development of coal and gas generator units and the rate of development of commercial air liners. They are all mature now, but improvements are small and incremental and take a long time. It’s taken about as long for commercial jet airliners to get to where they are now as it has taken for thermal nuclear reactors to get to Gen III+. It strains credulity to think that in a decade or two from now Gen IV will be a mature technology. It is just not realistic to believe that. Ziggy Switkowski has made that clear too, and I agree with him. In summary, on one hand I say it will take decades for Gen IV to reach the level of maturity of the current thermal reactors and to be cost competitive with Gen III+. On the other hand, I say nuclear could and should be cheaper than coal now if we had not been diverted from the least cost electricity goal that should have been the goal for the past 50 years, just as it has been for all other types of electricity generation. To get to the point of rolling small NPPs out fast off a production line (like gas turbines), we have an enormous culture change to make. We have to change the population’s aversion to nuclear. We have to effectively dump the NRC and start a fresh regulatory body with a clean sheet of paper and with its most important criteria as cost of electricity. (Before anyone screams again, cost includes the cost of safety, just as it does with aircraft, cars and everything else. There is a commercial balance. NPPs will never be risk free). I accept some of my statements may seem to some to be conflicting. But in my mind they are not. This comment is a bit of a ramble. I hope readers will attempt to understand the point I am trying to make, rather than pull out a sentence here and there and make some derisive comment. Douglas Wise — You asked about LCOE calculations for NPPs. I’ll answer on Open Thread 22 as it is rather off topic on this one. I think the solution is quite clear and is being implemented as we speak. The developed nations have to move to the sidelines and allow India and China to resolve the cost problem. 1) their energy consumption will eventually dwarf ours. 2) we can get our emissions pretty low by replacing our coal use with natural gas plus little wind. I hope we will choose to take a leadership role (the benefits would be in economics, safety, and perhaps weapons proliferation), but as you have said, we have to undo a lot of momentum in the wrong direction first. Costs of construction vary wildly with time, place and circumstances. FOAK factor has already been mentioned. Let us compare some FOAK’s in advanced stage of construction. Costs of Indian PFBR have been given as $622-544 million for a 500MW plant. This translates to $1244-1088/kW. The first two large PWR’s 0f Russian design nearing completion cost $ 2.6 billion, nearly the same cost per kW. Both are higher than the Indian PHWR costs. The planned French EPR’s will cost higher. The Chinese could conceivably better the costs. You should not dismiss the fast reactors on capital costs alone. Re Australia starting with GenIV reactors. I think that Australia, who have provided uranium fuel to many LWR’s so far, are entitled to start with any selected design. There is a Russian design that works with 16.5%LEU fuel and the Russians are starting construction on it. Australia could start simultaneously with the same design and then develop pyroprocessing and recycled fuel. For even faster and cost-effective start they could get some Indian PHWR’s and join India as it proceeds to metallic fuel and pyroprocessing. I think realistically the first power reactor in Australia would be US designed due to security concerns. That means the US Nuclear Regulatory Commission would be the default authorising body. Areva have nixed their chances with slow builds in Europe. A Chinese company was banned from the national broadband rollout on a flimsy pretext so I doubt India would get favourable consideration. Some mining and desalination projects could use SMRs but the first model to get NRC approval seems likely to be the Nuscale. It might be considered after a working model was demonstrated in the US. After several AP 1000 or variants have been built it should get a look in. Several states in Australia notably SA, Vic and NSW will soon need a gigawatt-plus baseload plant. I agree. I think you are stating the reality. Unfortunately, the cost of nuclear in the western democracies is mostly due to factors other than the cost of the purchasing the equipment. This is demonstrated because a given plant, like an AP1000, would cost about twice as much in Australia as in USA and about four times as much as in Korea. Much of the cost on a nuclear plant in western democracies is due to investor risk premium and a host of other costs we cause as a result of our (regulations.) The plant cost accounts for around 80% of the cost of electricity from a nuclear plant. As you say, the way Australia is heading (and USA, UK and EU) it seems we are locking ourselves into focusing on gas for a long time. 2) we can get our emissions pretty low by replacing our coal use with natural gas plus a little wind. I don’t believe gas, with some wind, will reduce our emissions by much. I agree. Importantly, if GHG reduction is important I’d say the benefit of low cost nuclear is far greater than in just reducing China’s and India’s emissions. Most of the emissions growth over the decades ahead will come from the developing world, especially from the poorest countries. As they develop they will build power stations. If fossil fuel generation is cheaper than nuclear, they will build fossil fuel power stations. No amount of UN conferences or climate activism will change that reality. Nor will our toying with CO2 taxes and ETSs. They simply will not curtail their development. Therefore, if the developed countries want to assist the world to reduce global GHG emissions, the focus needs to be on getting nuclear power to be cheaper than coal power. You could well be correct that Australia will likely be locked in to the US NRC approved plants, and possibly to AP1000 or others. What that means, I believe, is that nuclear will not be economically viable in Australia for decades. Until we are ready to break free from the thinking you summarised (correctly) in your comment, nuclear will not be a viable option for Australia. we can get our emissions pretty low by replacing our coal use with natural gas plus little wind. I would challenge such assertions. Methane leakage combined with throttling inefficiency in a gas-wind grid make it just about as bad as coal in GhG emissions. We do not even know how bad methane lifecycle emissions are from gas since no one to my knowledge has bothered to measure it at all stages of the lifecycle (drilling, transport, combustion). If your assertion is that natural gas and wind is cleaner in air pollution such as sulpur, particulate, and heavy metals, then that is correct. But the emissions of such pollutants for a gas grid are just as high as for a gas-wind grid. In fact, throttling gas turbines a lot (in a wind grid) increases their NOx emissions. So why put in expensive wind turbines? It does not help with GhG, it makes pollution worse than a pure gas grid, and only saves a little gas, maybe 10% for a 20% gas grid. Any gains that are made will just be annihilated by the slightest economic growth. And then we’ll find that we emit just as much CO2 as when we started out with the expensive unreliable wind grid. posted 9 April 2012 at 4:41 PM by Cyril R.
Induction of PRISM metallic fuel, sodium cooled fast reactors has also been discussed. Only a small number of reactors only for once through use of plutonium stocks for denaturing it for weapons use is considered. According to current thinking, plutonium is a negative value item, like the untreated SNF. Lowest cost disposal is being considered. Paying for FOAK PRISM reactor, which may be a good idea as a part of IFR closed cycle fuel system, is not a cost effective solution for once through use. A better solution would be its use as a fissile feed with thorium, as someone (Douglas Wise) has remarked that Indians might do. Transfer of a part of Pu stocks to India might be a good idea. They will use it in fast reactors which are a part of their closed fuel cycle. They could also develop a thorium-Puo2 CERMET fuel for use in the EPR’s planned in both the countries. Outsourcing the fuel development with its risks is a cost effective plan for the UK. If we now have to consider a double wall tube design, there goes the cost numbers thru the roof. The EBR-II used a double walled steam generator tubing. I don’t have a picture of it. It worked very well. There were no leaks. Still you want an isolation system to quench a fire should it occur (a commercial plant will have two orders of magnitude more tubes area). It is true that the heat transfer coefficient is reduced with duplex tubing. This is adjusted by having more surface area (bigger steam generator) or settling for a lower steam temperature. Either way it costs a bit but it is not too bad. EBR-II costs about $4/Watt in today’s money like I said upthread. The bigger turbine, generator and condenser that a commercial plant would have costs less per watt and is more efficient, that alone should push it down to $3/Watt. If a helium Brayton cycle is available, that can be used which further increases efficiency and removes the need for double walled tubing and very fast acting sodium/steam engineered isolation provisions. posted 10 April 2012 at 5:51 AM by Cyril R.
what is in between the two walls?? The other advantage of a closed Brayton cycle over and open one is that,, in the CLOSED Brayton,, you just vary the mass flow not the T4 when you go to a part load condition. This makes the machine much more efficient at part load. The ongoing discussion about the details of the basic physics of Gen IV, (not even the engineering, let alone the financing), reinforces my impressions that Gen IV is many decades away from being a viable option. For example, I see discussions about double tubes and wonder how will thery be kept separated and what are the stresses on the spacers. How long will lthey last? What happens when they crack? I recall the problems of cracking in the Pickering (Toronto, Canada) tubes about 15 years into the life of the plants. All the plants had to be retubed. And I recall the problems with the double skinned LBG tanks for tankers carrying LNG from a gas field to Alice Springs in about 1991. The spacers broke, the innmer skin fell onto the outer skin, the LNG boiled off, the truck ran out of LNG and had to be towed to base with a diesel truck! That si just one example of the millions of problems that will have to be solved as breeder reactors progress from their Gen I to their Gen III+ over a period of many decades. As I said in a previous comment, I am convinced that placing so much emphasis on advocating Gen IV, in Australia, at this stage, is counter productive. It is a distraction from what needs to be done – from where our emphasis and our resources should be directed. While we are pushing Gen IV, most people realise it isd not a viabl option. So we are implementing gas. I believe that is a really big mistake. We’ll head off down the gas route and it will take decades to turn that freight train around. We are implementing policies and power plants that will have a fourty year life. Sodium coolant for fast reactors is still in favor in spite of it being responsible for many accidents and termination of fast reactor programs. It is due to its compatibility to steel and other metallic materials. This being the case, you could let it remain as the primary coolant inside the reactor vessel and use a safer and lower cost metal or salt eutectic as the secondary coolant to bring the heat outside the vessel, where it could get exposed to air or water through any leaks. You could deal with the US and its NRC if, and only if, you have decades and billions to spare. Russia, China or India, who are building fast reactors for themselves, are better bets. They will also cost lower. Sandia Labs in Albuquerque is developing a high temperature CO2 closed Brayton cycle turbine. Peter, I accept your point that gas+wind won’t push our emission down very much. But that appears to be all that we in the US are willing to do. – It certainly would be more pragmatic to start with two or three 500MW SMR LWR plants. By the time you build a regulatory structure, build adequate public support, and get them built, some Gen IV reactors may be in production. Build a waste repository and you’re even deeper into the Gen IV timeframe. – It is important to have a roadmap. Starting with LWRs is more reasonable if you have a clear path to sustainable nuclear. – Include transportation fuel synthesis in your road map. Consider including a nuclear assisted coal-to-liquids component, even if the main thrust is nuclear ammonia. It’s less of a change, and people hate change. – The reasons Australia should have a nuclear program are the same as the reason to solar enthusiasts want a solar program (to help bring down the cost for everyone and to benefit from any breakthrough that occurs in the future) and space enthusiasts want a space program (hope for humanity’s future and to motivate kids to study science. It has to come back in 2015 ready or not. Elsewhere I’ve seen the waste described as ‘high level’. I say we should do the whole nuclear fuel cycle of mining, enrichment reprocessing, 3rd and 4th generation power and geologic disposal. “Gen IV is many decades away from being a viable option”. Perhaps you’d like to pass this factoid to GE Hitachi and the UK Government. While you’re at it, the Indian Government might also be able to save itself a lot of grief were it to ask for your consultancy services. Clearly, the South Koreans, having more or less built a pyroprocessing plant, are so premature in their actions that advice from you may well fall on deaf ears. The argument about whether Australia should go straight to Gen IV or only via Gen III is altogether more nuanced. However, the first step is surely to destroy the political anti nuclear roadblock. I’m with Barry when he disagrees with Peter Lang’s “pessimism”, especially because Barry chose to express himself by dumping on Vaclav Smil. But I agree with Peter’s comment on why nuclear is not cheaper than coal now. As I understand things, some of the US reactors that were built before the “regulations and navel gazing created by 50 years of anti nuclear protesting” Peter refers to are still operating. If all the navel gazing BS regulations are so absolutely necessary for safe operation how is this possible? People who actually believe it would take decades to start cranking out a new design such as the IFR should study what Rickover did with the Nautilus. He not only had to build a reactor but the design had to fit into a 28 foot wide submarine. All they basically knew was they thought it could be done. They didn’t even know what fuel they were going to use. They took on the project assuming they’d make the discoveries that would be necessary for them to complete it. Or think about Fermi who built something when no one had ever produced a reactor before. They just dreamed it up and did it. What is all this negative talk? It would take a political process to initiate an institution that would identify — and cost — the impediments to cost-competitive non-carbon generation of power (in Australia). Peter Lang was referring specifically to making nuclear cost competitive, however the minister concerned need not mention the (currently) politically suicidal term “nuclear”. It would be a clear project for a Minister charged with mitigation of climate change, to “identify the requirements for the cost-effective and complete replacement of carbon in our energy supplies”. Such a declaration has no mention of negatives or the fearful word, although it will become quickly evident to the researchers what is required for such a hard target. Both technically and socially, that is. For example, I see discussions about double tubes and wonder how will thery be kept separated and what are the stresses on the spacers. How long will lthey last? What happens when they crack? That is a false interpretation Peter Lang. This discussion here on BNC is not one among nuclear engineers busying themselves on a detailed IFR design. (Which has, by the way, been finalized in several different variants by GE-Hitachi, eg S-PRISM). This is a discussion among interested laymen and non-nuclear engineers and energy professionals. As such the discussion is largely superficial. We first have to talk about the physics and the basic engineering as an introduction to the technology. I could talk about how delayed hyride saturation cracking caused CANDU pressure tubes to fail, and how weight function based process-zone procedures have been developed for delayed hydride saturation cracking, and how these have been recently implemented in the CSA Standard N285.8. But this would only cause yawning and confusion. The truth is that several SFRs have been finalized and a couple are being constructed right now around the world. Only the integrated processor requires more testing and scaleup, the testing and scalup for the other components is modest. The truth is also that the EBR-II ran successfully for decades, it generated billions of kWhs of electricity, and it used the double walled steam generator tubes, and there was no failure of these tubes during the many years of its operation. In addition there have been developed and used, sodium-steam isolation valves for rapidly isolating any leak. Also techniques have been developed by ORNL for remote tube plugging while the reactor is online at full power (there are extra tubes to cover this). The regulatory environment is almost certainly the biggest impediment to any Gen IV reactor. Various pebble bed reactors have successfully operated. But licensing them is very difficult. In the UK I think it is easier than in the USA because there are multiple coolants used in today’s UK operating reactors (CO2 and H2O). But sodium is something very different, and fast reactors are something very different, in regulatory terms. The regulators first have to “get smart” and this will be a long and costly procedure for a company pushing for a Gen IV reactor. That is a false interpretation Peter Lang. Don’t you mean, in your opinion, it is your impression that it is a false impression? It is certainly my impression, and clearly evidenced by the comments on BNC. The truth is that several SFRs have been finalized and a couple are being constructed right now around the world. That statement ignores the point I made – i.e. that it will take decades for breeder reactors to become mature and commercially viable. There will be millions of problems to solve along the way. They will have low productivity (low capactity factors) for a very long time, just as the breeder reactors built in the past have had. They will go through a similar development cycle as have thermal Gen I, Gen II, Gen III. And they will go through development and maturity stages like commercial air liners and the supporting systems, and coal and gas generators. The breeder reactors being built now are prototype and demonstration projects. I’d urge you to be realistic and not exaggerate. It does more harm than good, because experience people see right through the exaggeration and advocacy for a cause, and from then on give less credit to those arguing for the cause. In a previous comment (@9 April 2012 at 4:06 PM) I mentioned some of the impediments to business in Australia to provide examples of the reasons why projections of the cost of an AP1000 power station in Australia would be twice the cost of the same plant in USA and four times the cost of that plant in Korea. In the paper, the groups cite the case of one major resources project that took more than two years to get environmental approvals, involved more than 4000 meetings and presentations with interest groups and prompted a 12,000-page report. The project was approved with more than 1200 state conditions and 300 federal conditions, with a further 8000 sub-conditions. This is just one of many examples of why nuclear power would be prohibitively expensive in Australia. It’s why I keep arguing that we need to identify the impediments to low cost nuclear, prioritise them for removal, work out which can and should be removed or modified, work out the best way to approach it, and then do it. When you say it will be decades for breeder reactors to become commercially viable, what do you mean exactly? The first commercial PWR was built in the US in 1960. Within 2 decades there were hundreds of Gen II reactors worldwide. Then the construction rate declined rapidly after the late 70s. If GE-Hitachi do demonstrate a commercial fast breeder reactor with fuel recycling within the next few years, who’s to say the build rate can’t follow the trajectory Gen II reactors did after 1960 if there is political will? We do have the climate imperative afterall, something we were completely unaware of when Gen II reactors were commissioned in the 60s and 70s. If you want to quote my conclusion without my argument you’re on your way to have a bad debate. Again BNC is not a venue for nuclear engineers where every bolt is debated. BNC does not detail every bolt in an AP1000 even though that is a fuly developed design being built right now. You’re setting up a straw man argument. That statement ignores the point I made – i.e. that it will take decades for breeder reactors to become mature and commercially viable. There will be millions of problems to solve along the way. So what? We can’t solve global warming in 20 years, probably not in 40 years either. Better we work on something promising than delude ourselves and throw hundreds of billions of subsidies in wind and solar and end up using just as much fossil fuel (like Germany has done over the past 20 years). While we work on Gen IV we can build lots of Gen III+ such as EPRs ABWRs AP1000, or a Korean build, they’re great as well. If you are on a different wavelength to me on this, so be it. We can agree to differ. 2. Australia, like most countries, is moving away from public sector ownership of electricity assets; the trend has been going for over 20 years, is not abating and is suppored by most reviews; that is, we must continue and complete the privatisation of the electricity industry; we are not turning back. Nor would it be good policy to return to public ownership. The public would have to invest over $120 billion to procure the existing assets, invest another $30 billion to upgrade the grid, $100 billion odd to build $20 GW of nuclear, and double that to take us up to where we’d need to be by about 2040. All that public investment would be at the expense of services and infrastructure that Australians agree is better provided by the public sector – such as Health, Education, public infrastructure such as public transport. We can’t even afford to provide main roads any more. So can I urge BNC commenters to get realistic – we are not going to return to public ownership of the electricity system; we are going to continue privatising until it is all privatised. That’s the reality. 8. Australia will not build Gen IV until they are commercially viable and proved; and nor should we. 9. Therefore, placing excessive focus on Gen IV in Australia is a distraction from where our focus should be. It is unhelpful. It is wasting our resources. 10. Progress on nuclear was set back by around a decade at the 2007 election when we turned out back on a clear commitment to pursue nuclear. Spending so much time on arguing about Gen IV, instead of discussing genuine and realistic policy approaches, is not helping us to move forward, IMO. Maximum nuclear construction is going on where it is in govt control in France, Russia and China. In India, the commissioning of Kudankulam power station has been held up in spite of govt carrying all the risk. Ultimately the realization of requirement of power enabled the resumption of work. In India, the pressure on land due to high population density provokes resistance to any change in land use. It has been so even in case of hydroelectric projects and surprisingly, even a car plant. However what really takes the cake is the same thing in the US! The more densely populated among states in Australia would be experiencing the same problems. Nuclear power is trusted the least. This public resistance adds to time and financial costs. @Jagdish. Here in Australia, those of us who know that uranium is ubiquitous, and modest deposits are common, have been puzzled as to why India has been unable to develop its own uranium industry. It takes a visit to India to realise that the land is covered by people, and people closest to the land are most resistant to change in land use. Similarly, uranium mines in Australia can be planned on country which has been occupied throughout the depth of verbal history, by very conservative people. They too are worried by change in the use of their land. Considering that the power source of a gigawatt grid must be close to the centre of a mass of people consuming a gigawatt, it turns out that a nuclear reactor in Australia would also have to be centred among a population density far above the continental average, so a construction site would have lots of neighbours. Following the hysteria at Three Mile Island, antinuclear campaigners learnt how easy it is to frighten the neighbours. Financiers in turn have learnt how delays to construction cause crippling escalations in costs. It must seem like sabotage. After Fukushima, an accumulation of used fuel has become one of the bogeys that can be used to delay and financially cripple construction. The IFR promises the fearful to limit the accumulation of used fuel to a few months worth, as it is reprocessed in the electrofining unit. For that matter, if people can be made fearful of the reprocessing facilities at an IFR, they might be more easily reassured if the reprocessing facilities were moved elsewhere, to a less densely populated part of its host country. But then of course, it would no longer be an “Integral” Fast Reactor. My only quibble regarding your population density discussion is that population is not spread uniformly at any scale, either national or regional. The existing power stations within (for example) NSW are typically 2+ GW, coal fired and very well connected to population centres and hence load centres. It may well be essential to locate power stations within range of their loads, but it is still totally unnecessary to locate power stations alongside or within densely populated suburbs. Options available right now include using the proposed 2GW thermal site called Bayswater 2 in the Hunter Valley to develop as much as 7GW over time. This is pretty much the target of an IFR. The transmission lines already exist, as also the land holdings and cooling water (if required – I favour dry cooling towers, now that I know a bit about them). So, the concept is to start with two power stations (Liddell and Bayswater) with combined baseload capacity of almost 5GW, plus an identified site worth another 2GW on the same land and under single ownership, already zoned appropriately. Within 5 years, the first unit could be in service. By the tenth year, the full 7GW producing plus 50% of the electrorefining facility which will keep the whole show on the road for about 50 years more – until 2070. The local communities already provide skilled operators and tradespersons, are already hosts to heavy power operations. The only bridge left to cross socially is the bridge of fear of the unknown. So, the missing ingredient is education. I’m sure that similar scenarios are true throughout any substantial power distribution network, such as exists in each state of Australia. Let’s not propose construction of nuclear power facilities in or adjacent to built up areas. To do so is to add lead to our saddle bags. A Russian idea can be developed as a solution. They have developed floating power plants. If a floating power plant is standardized at medium size-500-700MW, It can be constructed at a shipyard like big commercial aircraft. One or two are kept ready for delivery. When a demand develops, one is towed to the site before the resistance develops. When the local population and administration gets used to the benefits, more can be placed onshore. Energy demand will always be there somewhere in the world. Those willing to host it or buy it can get them.